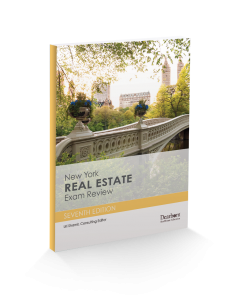 Based on the New York State Board of Real Estate exam content, this workbook offers over 800 study questions and two salesperson and broker exams to help candidates prepare for their licensing exams. This review is designed to be used in close conjunction with Dearborn’s Modern Real Estate Practice in New York for Salespersons and Modern Real Estate Practice in New York for Brokers. Each unit corresponds to a unit in the main texts, allowing students to easily review specific topics that they are having trouble mastering. The review is designed to simultaneously reinforce the student’s comprehension of important points and identify those areas that may require additional study.